Among the most joyful of textiles are wax print cottons, which have become known worldwide as the “fabric of Africa.” The centerpiece of a group of exhibitions all centering on contemporary African art and fashion at the Philadelphia Museum of Art is “Vlisco: African Fashion on a Global Stage,” which looks at these wax prints and the company most well-known for them, Vlisco. 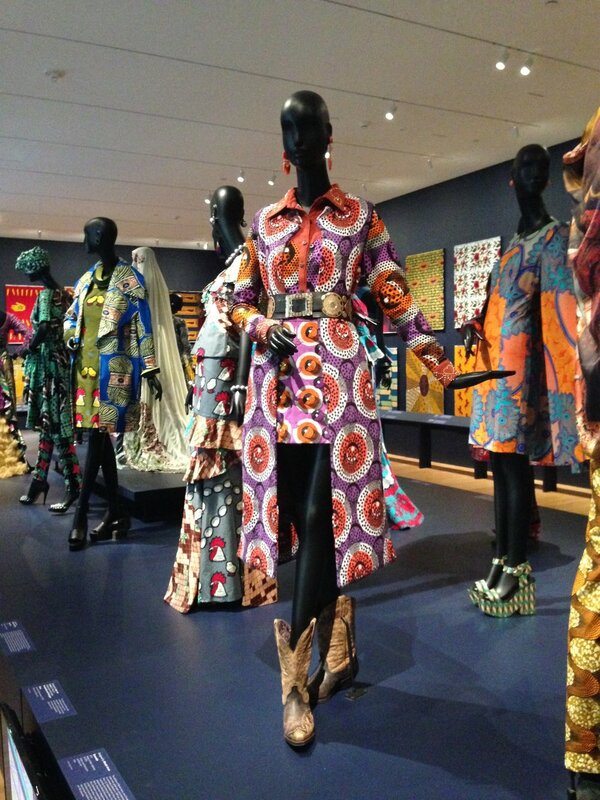 The single room of the exhibition features one large central platform of mannequins with textile designs lining the four walls. 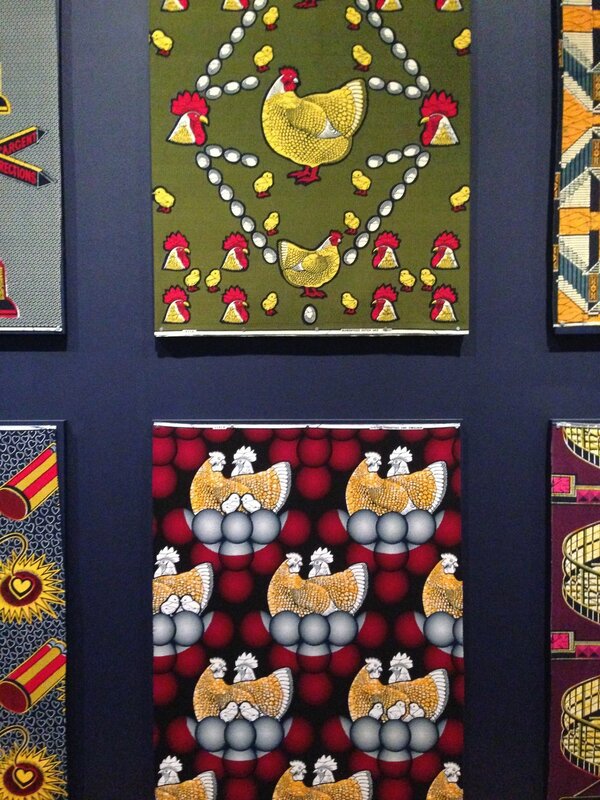 A true symbol of the beauty of cultural exchange, these wax prints are not African in origination or manufacture. When the Netherlands founded the Dutch East Indies in 1846, they developed methods of imitating traditional Indonesian batik effects using roller printing, using layers of resin and dyes to emulate the resist dye patterns. 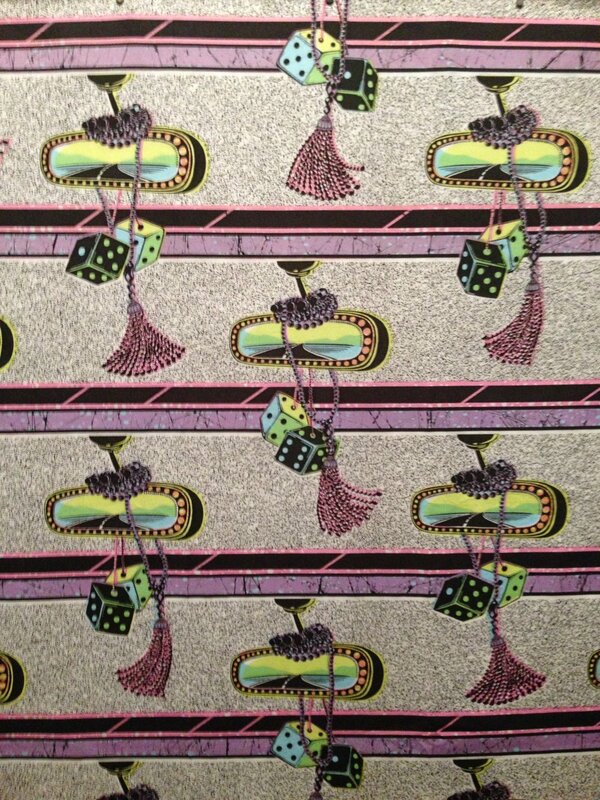 Manufacturing these textiles in Holland, they exported them to the DEI and then to West Africa from 1876. 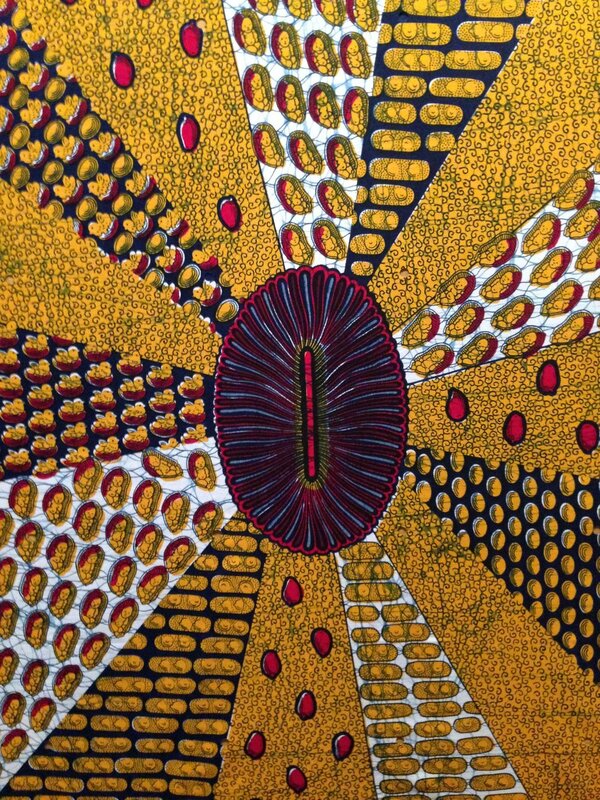 There they were embraced and became intricately connected with the culture—their popularity in Africa leading to an intriguing interchange of motifs and ideas as Vlisco developed patterns following correspondence with the market stall owners who sold the cloths. At the present moment, when discussions of cultural appropriation are so heightened, exhibitions like this—that illuminate the historical precedent of cross-cultural exchange—should be required viewing. Textile market stall owners were always women—textile sales being one of the few ways women could become powerful business owners in their own right. Trading textiles, particularly on a wholesale level, provided women with the opportunity to become entrepreneurs; in West Africa, these rich textile wholesalers are called “Mama Benz” or “Nana Benz,” as they are able to afford a Mercedes-Benz. 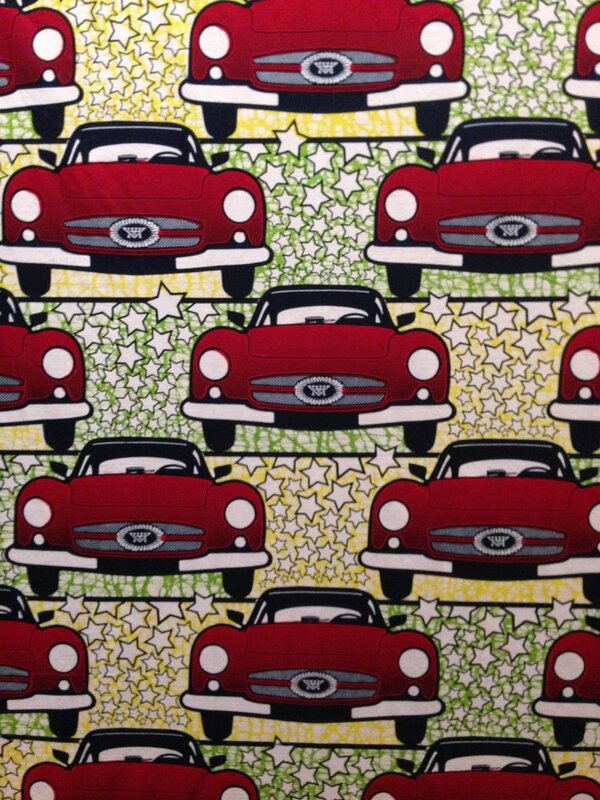 The moniker was coined by Togolese entrepreneur who, even known she could neither read nor write, became the first wholesaler to buy the German luxury car by growing her business from a market stall to a multi-million dollar wholesale company with exclusive rights to many classic Vlisco designs. 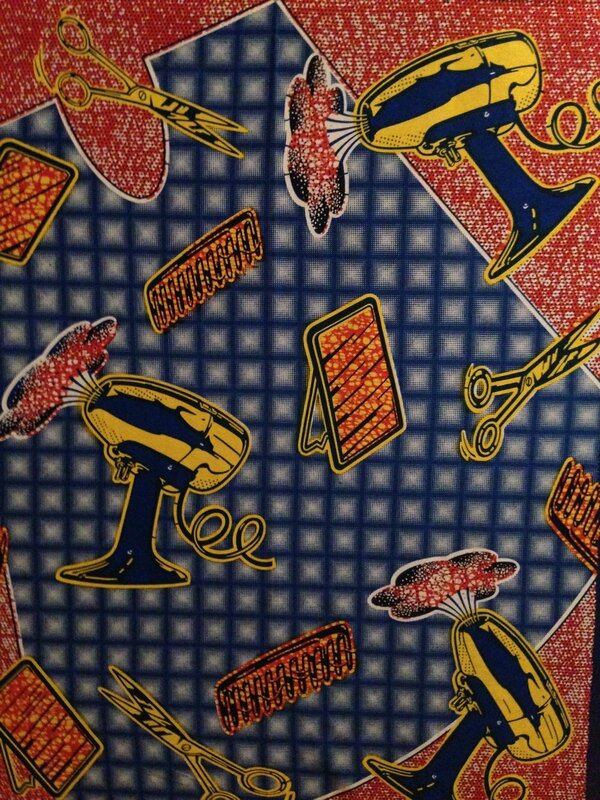 Due to political instability and inflation, over the last twenty years prices for Vlisco fabrics have skyrocketed; 12 yards of Vlisco cotton costs the same as the average monthly wage in Togo. 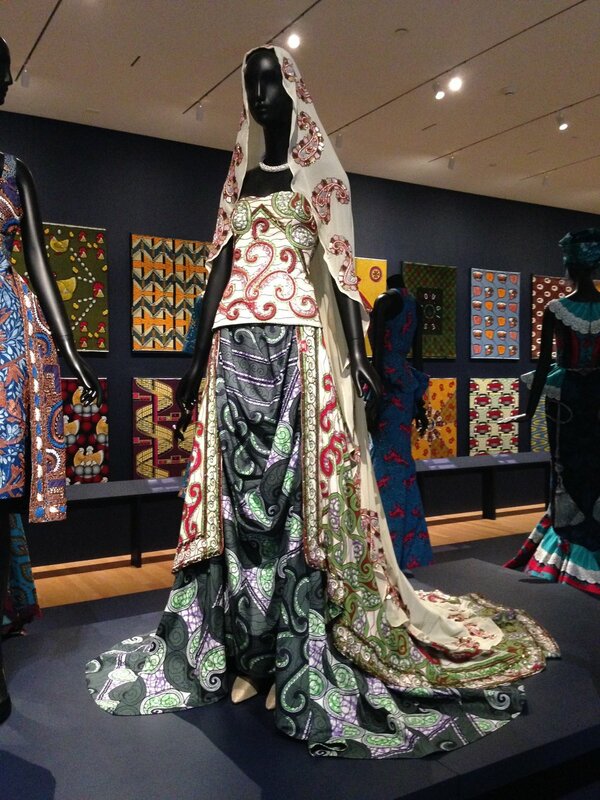 While they are still the iconic brand for this style of fabric, they have become that of the elite—as this exhibition was funded in part by Vlisco it is unsurprising that this aspect was not touched upon, but the relative inaccessibility of these textiles has forced Africans to look elsewhere for this type of fabric. The daughter of the original “Mama Benz”, Maggy Lawson, founded her own textile company, Manatex, which manufactures its cheaper grade cotton in China for a quarter of the price of Vlisco. As the fabrics arrived with only a stock number printed on the selvage—no pattern title—the traders and customers named them inspired by current events, religion, politics, or proverbs, with different areas and countries interpreting and describing the same pattern in often wildly different ways. While it is slightly problematic to have an exhibition (actually, group of exhibitions) that lumps the whole continent of Africa together as a single whole, there were pains made within the captions of the show to suggest the diversity of African cultures through the vast variety of names and meanings ascribed to the wax print textiles. Hung in whole widths, the textiles are luminous; all bright colors and oversized motifs. Stacked two high around the room, the upper prints were more difficult to see but fortunately (for the most part) the designs are emphatic enough to be understood from below. By looking at all of these prints it is apparent not just how great the interplay is between the Dutch designers and the African market, but also between the classic and the contemporary—Vlisco repeatedly reworks and redesigns iconic patterns for their modern customers. The most sensational fashions are predominantly by African designers, whose skill at tailoring with the intricate patterns is clearly visible. The gowns are playful, joyful and elegant; they often include appliques made from cutout pieces of a wax pattern or are heavily beaded. Made for galas and religious events, they testify to the stature and innate elegance of the women who would order these couture creations. 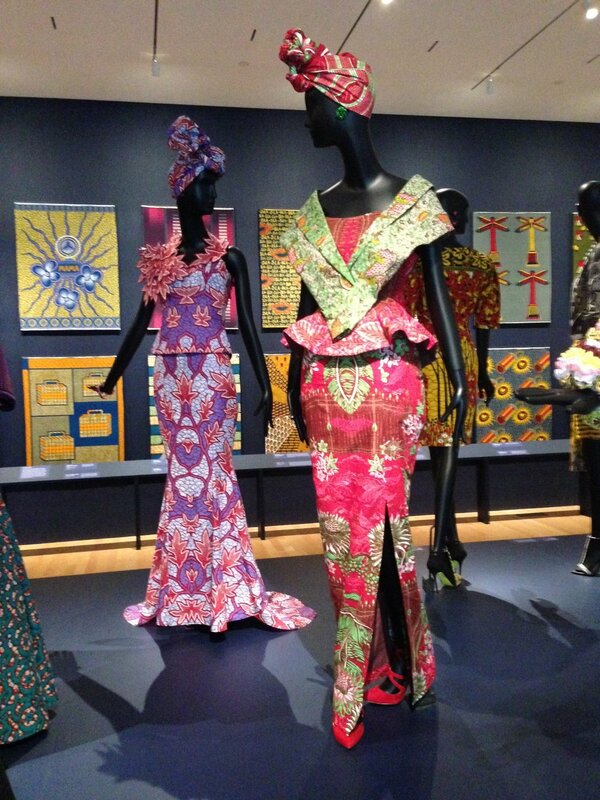 Many of the ensembles included in the exhibition are by Vlisco’s own in-house design team, who are all of European descent. Probably aware of the deep cultural design differences between their own team and that of the designers who use their textiles, Vlisco has long collaborated with local African designers on pieces for ad campaigns and for their magazine. In 2016 Vlisco took the step of initiating a new program where they will launch collections by top African designers four times a year, refocusing their fashion projects away from in-house, European-led styles. Their first designer capsule collection is with Ghana’s Stylista—twenty designs using textiles from Vlisco’s ‘Woven Wisdom’ collection. The only well-known designer based in Europe included in the exhibition is Indian-born Manish Arora, who collaborated with Vlisco on one of his collections. 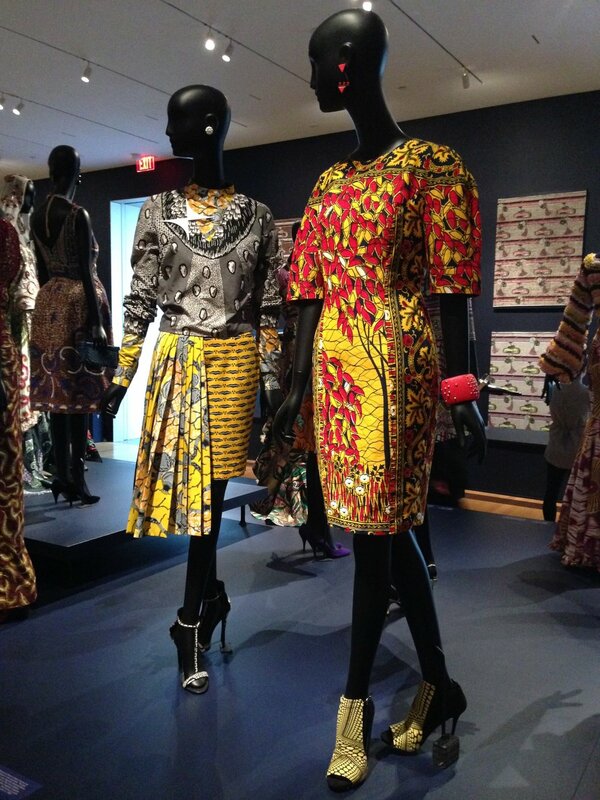 While other western designers have used wax prints in their designs, it is likely that the curators felt these veered into cultural appropriation—whereas the designs of Vlisco’s in-house team were western but created in response to close contact with their West African wholesalers, those of major European and American fashion designers would be merely using the fabric, removing it from its cultural significance in Africa. The beauty of these textiles and garments is undeniable, and when considered in light of their history they are a remarkable vision of cross-cultural exchange at its best. 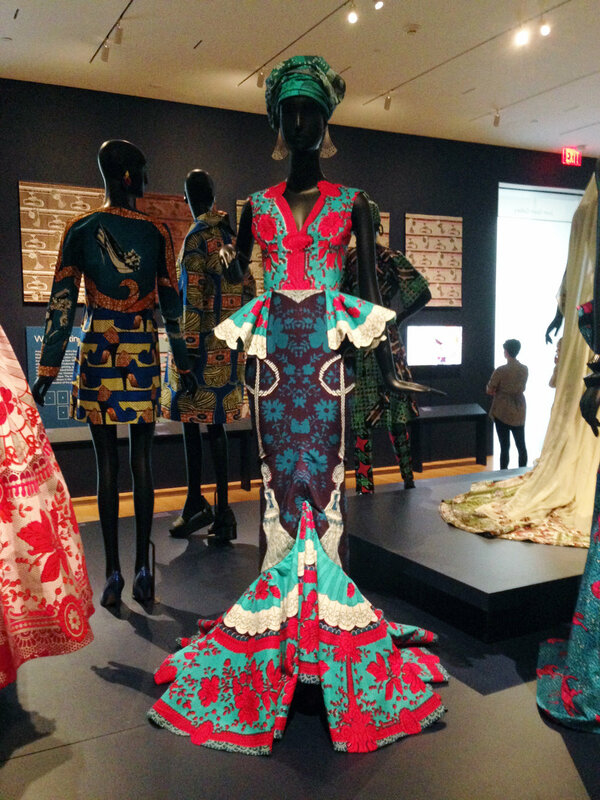 The exhibition could have benefited from some quotes from African designers, traders or customers to provide context on the cultural and personal importance of these fabrics; while providing a fount of historical information, the show did not make enough of the deep cultural connection many people in West Africa and the diaspora have with these textiles. 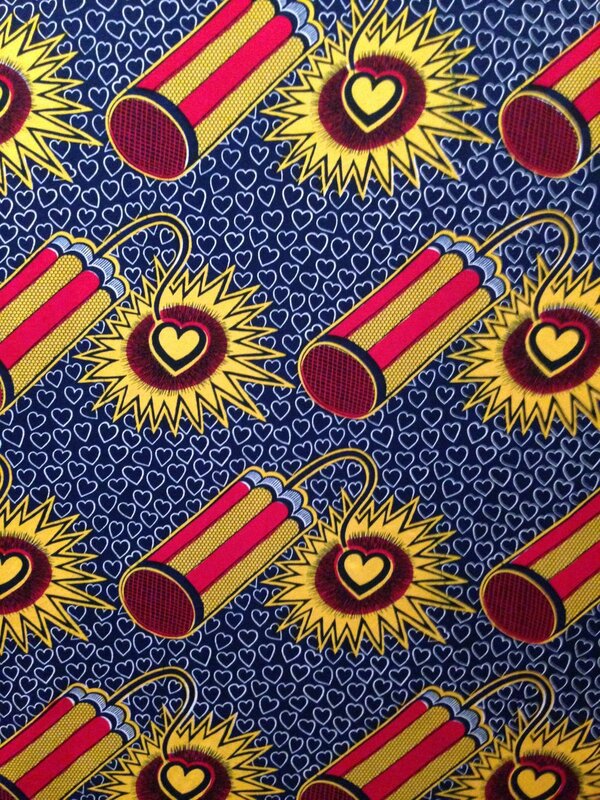 Outside of fashion, these fabrics have taken on a new life in the work of the acclaimed Nigerian-British artist Yinka Shonibare, whose artwork directly deals with issues of colonialism. For him, wax print textiles are a vivid signifier of cross-cultural exchange: "But actually, the fabrics are not really authentically African the way people think. They prove to have a crossbred cultural background quite of their own. And it’s the fallacy of that signification that I like. It’s the way I view culture—it’s an artificial construct." 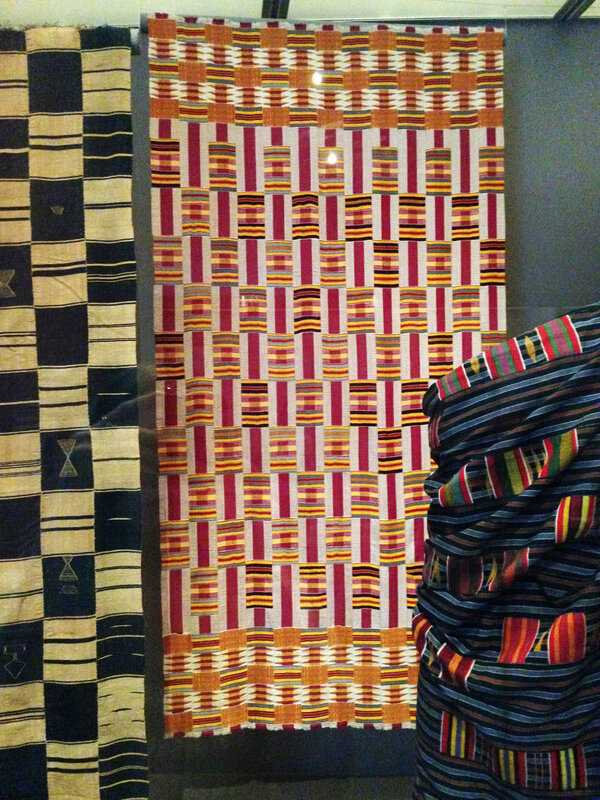 On the surface, to most people these fabrics represent “Africa”—yet in fact they are symbols of the cross-connections of trade that evolved before, during and after colonialism, and how those connections impacted and shaped multiple cultures. 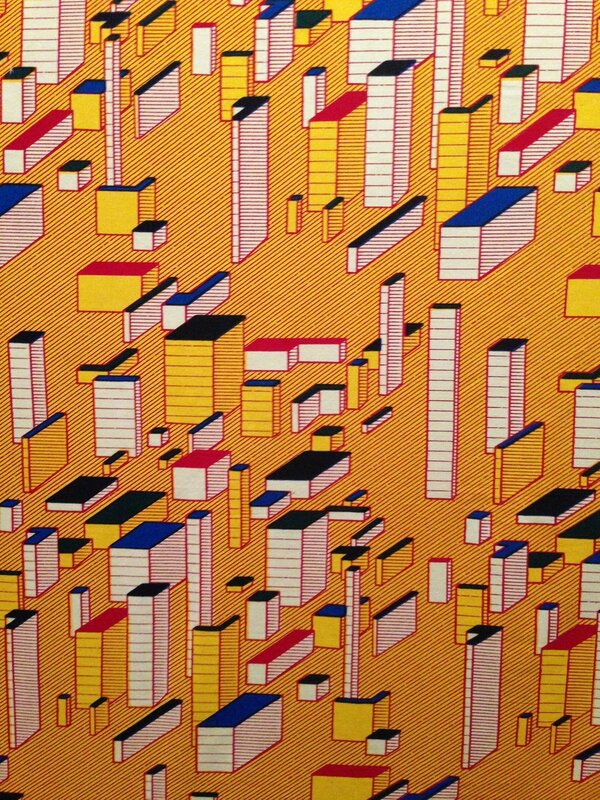 Culture (through textiles/fashion/art/etc.) has never been created in a vacuum—hopefully by valuing the interplay (and interdependence) between cultures and their art forms, we can produce a global society of greater respect and admiration.